Summertime is a great time for gatherings with lots of food and lots of friends. 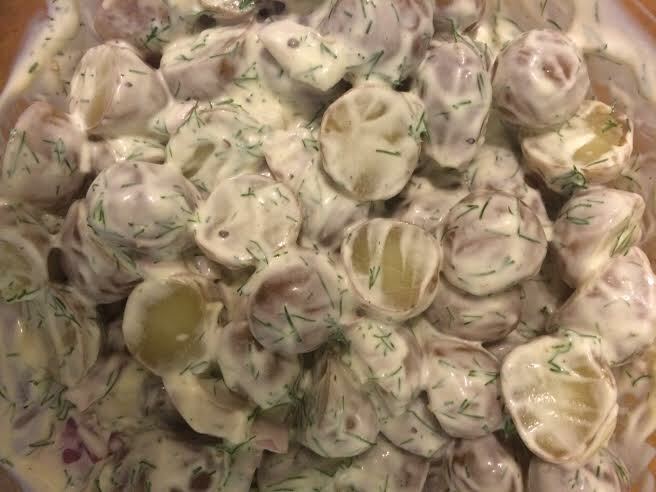 One of my go-to recipes for any BBQ contribution is my Dilled New Potato Salad (actually, it’s my sister’s recipe but she doesn’t know I blog, so HA!) The best part about this recipe, aside from how ridiculously easy it is, is that it can be used as a potato salad dressing, dip for chips or pita, and a great chicken marinade. Even better is that it is pretty healthy as well! Cut your potatoes into manageable sections – halves or quarters – and place into pot. I find it is easiest (and safest) to do this BEFORE there is water in your pot. Fill your pot with water to just cover the potatoes. Boil. When potatoes are tender – check by poking them with a fork – drain them. If you are going the warm salad route, put your potatoes in a bowl off to the side. If you are going the cold salad route, put them in the fridge to cool. If you are in a bit of a hurry, stick them in the freezer – works like a charm! 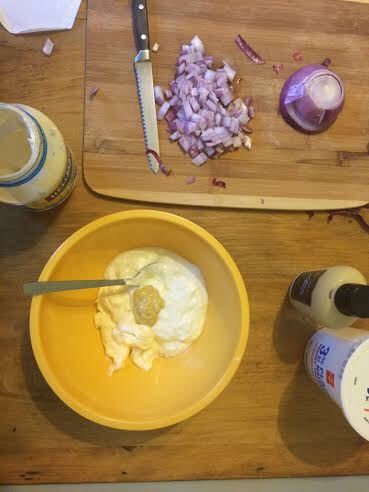 In a separate bowl, combine the mayo, yogurt, and mustard. I like to go back at the end and add a little bit more dijon for a some kick. Add the onion and your dill. Don’t add all of your onion at once – sometimes they can be overpowering, so taste before you add! Use some cracked pepper to season – combine and taste – you will probably need more than you think you will. Keep the contents of your bowls separate, combining right before you serve. This salad will last up to 3 days after you have combined the ingredients. Enjoy!